I collected Axel back from the boarding place yesterday. I boarded him at Pets4U located in Bandar Puteri, Puchong. I first got to know about this place from the Petster magazine, Malaysian No.1 FREE Pet Lifestyle Magazine. This magazine is available in most of the pet stores and I think it's a good avenue for pet business owners to advertise their services and products. Before I flew off to Bangkok, I actually went over to Pets4U to check the place out. It's a 1 unit shop lot and is kept really clean. I asked to see the boarding area and it's basically the back room with cages stacked on each other. Oh well... I have checked a few of such boarding services and they looked the same, except for the one at St Angel Animal Medical Center where cages are built-in and made of stainless steel. I wanted to try Pets4U as they looked friendlier from their advertisement. 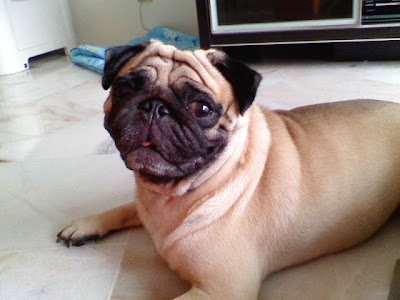 The boarding rate for an adult pug is RM20 per night and food is provided. They will provide the same food that you feed your dog if they have that brand of food. Axel takes Avoderm and Pets4U do carry that brand. I have also asked whether the dogs are brought out from their cages now and then. The shop owner told me they do let the dogs loose within the shop. Dropping Axel off the day before I flew off felt really awful. It felt like a parent abandoning a child under the care of strangers. The shop owners have their own dogs in the shop. When we walked in, these dogs started to bark at us (or rather at Axel). I have to admit that it didn't feel very welcoming. I was asked to fill up a form and Axel was taken out from his carrier bag and put straight into a cage. He must have felt very confused, my poor boy. I then left the shop with a heavy heart and could only hope for the best while I was enjoying myself in the Land of Smiles. I came back on Sunday. I really love Bangkok and I am sure I will be going there again. Anyway back to Axel. Before I went over to Pets4U to collect him, I have asked for them to do a basic grooming on him. When I reached the shop, the shop owner's white schnauzer was there. This guy must be the alpha male type cause when I got in and put Axel's carrier bag down, he was like inspecting the carrier bag in and out. Then the lady went to take Axel out from his cage. As I was walking over to Axel, this white terror charged at Axel and practically pounced on him!! I shrieked thinking that he had bitten Axel but after careful inspection, thank goodness Axel was alright. They had to confine the schnauzer so that I can put Axel into his carrier bag. This got me wondering, do they really let boarding dogs out of the cages to roam within the shop when their resident dog is so aggressive? I paid up RM130 (for 5 nights boarding and RM30 for the basic grooming) and left the place feeling not "song". I mean would you feel nice after seeing your "baby" being pounced at? After leaving the place, I brought him to St Angel for his yearly health check and vaccination. Then I brought him home. Axel seems to be very tired after that, perhaps from the vaccination. Anyhow I couldn't shake off the thought of Axel being bullied at the boarding place. Perhaps I should research on others in case I need to board him again. You have any recommendation?